Solar roadways, a concept spread far and wide on social media during its Indiegogo campaign in June, is beginning to seem more and more like a pipe dream. After reaching 220% of its funding goal, the creators of the campaign have been all but silent about the technology itself, citing a focus on fulfilling their donator perks as a cause of the delays. The concept of solar roadways is simple: hexagonal electronic segments capped off by tempered glass, containing a solar panel. Supposedly, this design would allow space purely taken up by roads to also produce electricity, still maintaining their functionality while contributing to the power grid. In addition, LEDs would be installed so that the roadways could mimic the patterns of traditional roads, warning drivers of hazards or assuming other patterns as situations require. This concept was spread with the use of an animated video, tirelessly repeating the phrase “solar freakin’ roadways” in order to gain attention from people over social media—it worked. 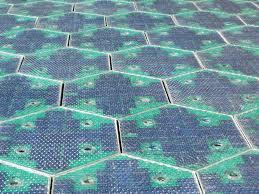 As a concept, solar roadways have met with some controversy concerning their campaign. Criticisms in parts of the design have sprung up, leading some people to dismiss the technology as practically difficult, if not outright impossible. These criticisms are so wide-ranging that those behind Solar Roadways have devoted an entire page in an attempt to refute these claims. Whether or not they are viable can’t be told, but what is obvious is that there are problems pressing the campaign not necessarily to do with engineering. Despite the fact that the campaign received over two times the funding it hoped for, it still seems a scarce amount to fund their project—a major part of the campaign is that the roadways pay for themselves. Solar Roadways have not released any information on the cost of the units per square foot, but it would likely be high—after all, solar panels aren’t cheap. The site gives no real estimate of how expensive these panels are, but even if they cost only $100 each to manufacture, the panels only take up four square feet—meaning that one million dollars would only pay for around 4600 feet of major highway. This is no small feat, of course, but would come nowhere close to covering all the surfaces that Solar Roadways proposes to cover—basketball courts, streets, roads—it’s just not in the budget. Keep in mind, as well, that the $100 figure is a completely arbitrary number on my part. The actual panels themselves would certainly cost more to manufacture, but the fact that even such an impossibly low estimate for cost leads to dubious results is concerning for Solar Roadways’ economic viability. It is possible, of course, that Solar Roadways as a company will not be successful, but their concept will turn into something that someone else will utilize. After all, before the Wright brothers (figures that those behind Solar Roadways seem to constantly mention in defense of the technology), countless people tried and failed to create a flying machine. Perhaps Solar Roadways will never come to fruition, but will help further technology in other ways—the success of their campaign shows the interest people have in renewable energy technology of this sort, and as such might inspire larger companies to invest in this sort of technology. Despite this, Solar Roadways has had a positive outlook, stating that progress is being continually made on the project. Only time will tell if this is simply a technological pipe dream, but with the hefty cost that an entire roadway of the units would bring and the concerns with the engineering, no one should be holding their breath for the roads outside their house to become much fancier. ‹ BPG: the Successor to JPEG’s Throne?